For those who wonder what’s up… 35 000 nautical miles later… Farewell! Adventure sailing is wonderful, but sometimes hard to combine with other aspects of life. So now that I find myself in a situation where I do not have the possibility to give the boat the time that it needs, I have decided to put it up for sale rather than just have it sitting unattended. This is a good opportunity if you are currently looking to build or renovate a boat of this class. The Journeyman has proven itself a very fast, capable and easy to handle offshore yacht, and all the core aspects of the boat are in very good shape. But 35 000 nautical miles over 4 years has taken its toll on interior and equipment, and those parts of the boat are in rather poor shape. Most of it should probably be replaced or renovated. This is also a good opportunity to rearrange the interior to your liking. So if your looking for a turnkey yacht right now this is not the boat for you. But if you are looking to build your own, you can get a very nice headstart here. Just the hull, machinery and rigging of a new yacht like this will cost you maybe 400k EUR and take maybe 8-14 months to complete. 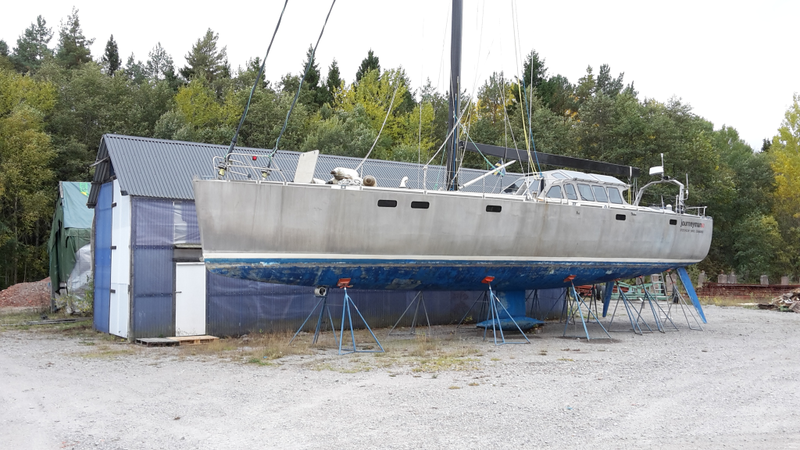 I am offering the boat as is at 250k EUR, and it’s already done. Just replace the broken or worn out equipment and redo the interior, and you have a nice new yacht, cheaper and faster than building from scratch! The boat is currently on land in Stockholm, Sweden. E-mail me for more information! Hi I am interested in your boat. Can you please give me more info on the broken and worn out equipment that needs to be replaced? Is there any structural damage to the boat or the lifting keel? Is it possible to get pictures of the interior in its current state? Is the rigging OK? Are her sails OK? Is the main engine OK? Which instruments come with the boat and do they function properly? Can she cross the Atlantic in her current state? Given your experience with her can you give me an estimate in EUR. of what you think it will cost to bring her back into a good shape in Sweden? Please contact me via email jesper@journeyman.se. It’s not practical to discuss via comments.